Payday loans are relatively new in Canada. They are short term loans. Payday loans in Canada can provide customers facing a short-term financial crisis an easy way to get fast cash. The truth is that many customers feel they have a very good experience with payday loans in Canada. With a payday loan you can borrow money and you will pay back the loan in a much shorter amount of time compared to a “Fast Cash title loan”. In most provinces the loan is up to 14 days. The interest rate is 21% for that period. In 2006, the Criminal Code of Canada was amended to allow for Provinces to regulate the payday loan industry. Ontario enacted the Payday Loans Act, in 2008. In Ontario the rules allowed the company to charge 21% for up to 14 days. In Ontario that made the effective annual interest rate of 548%. Other Provinces have different, but many similar regulations. With “Fast Cash” title loans the loan period is up to 5 years not 10 days. With “Fast Cash” the interest rate is between 1% to 3% per month. With “Fast Cash Title Loans” you keep the car and drive away. Also with “Fast Cash” you can have you money within a hour. With “Fast Cash” you also can borrow up to $50,000. You also have no job requirements, no credit checks and fast approval. A Canadian pawn shop business provides collateral loans. Pawn shops offer loans, secured by something of value. ie. the Car. The pawn store may have other business elements such as sales. However, pawnbrokers focus on lending money against collateral. In Canada, pawning an item is very similar. A pawnbroker inquires how much an individual is hoping to borrow then names the amount he is willing to lend the customer. When the amount is agreed to, the item/vehicle is then taken and stored at the pawn shop. The item may be reclaimed at any time within the loan period marked on the ticket by full repayment of the loan, plus interest and service and storage charges. Pawnshops are, in fact, all over Canada. Part of the advantage of acquiring ready cash is that no explanation is required regarding why the money is needed. Most loans are generally for 30 days or less. In Canada average monthly interest rate including ( Interest and Service and Storage Charges ) is 20% to 30% per month. Again this can have a effective annual interest rate of over 500% per year. With pawn shops you have no job requirements, no credit checks and fast approval. With “Fast Cash” title loans the loan period is up to 5 years not 10 days. With “Fast Cash” the interest rate is between 1% to 3% per month. With “Fast Cash Title Loans” you keep the car and drive away. This is not the usual situation with Pawn Shops who hold your car at their location. Also with “Fast Cash” you can have you money within a hour. With “Fast Cash” you also can borrow up to $50,000. You also have no job requirements, no credit checks and fast approval. 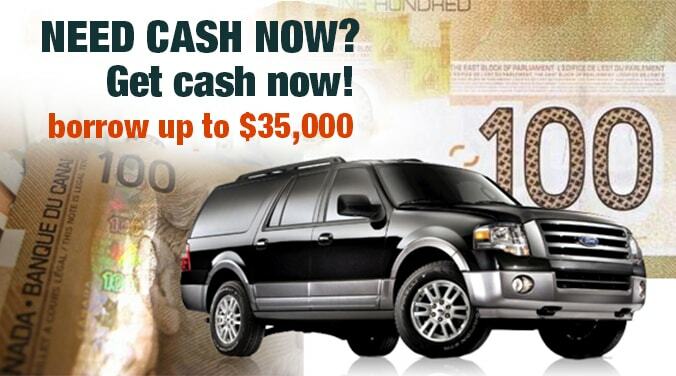 Most Canadian Car Title loan companies lend funds on the value of your car. You complete an application and then your application is processed. In many cases this can take up to 10 business days. You have to be employed and a credit check may be done. You must also have a steady source of income. You repay the loan, which includes fees and interest, within the time period allowed (usually 30 to 90 days) and reclaim the title, lien-free. In some cases they keep the car at their location. As with Pawn Shop loans the interest rate can be as high as 25% per month. With “Fast Cash” title loans the loan period is up to 5 years not 10 days. With “Fast Cash” the interest rate is between 1% to 3% per month. With “Fast Cash Title Loans” you keep the car and drive away. This is not the usual situation with most car title loan companies who hold your car at their location. Also with “Fast Cash” you can have you money within a hour. With “Fast Cash” you also can borrow up to $50,000. You also have no job requirements, no credit checks and fast approval.